Since our inception in 1973 we have grown from two men to dozens of highly qualified professionals. Leading equipment and selection is important, but the quality and commitment of our people is what sets us apart. Many of our employees have been with us over seven years; we see this as a testament to the value we place on having great people. Our merger with Pyramid Corporation has further increased our service capabilities. We have been able to grow our product offering, implement more mobile units and add their industry experience to ours. 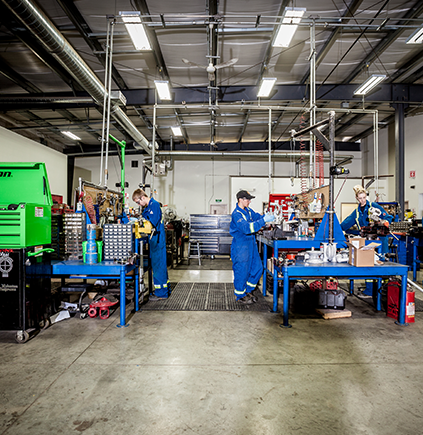 Combining our products has made us the largest inventory of parts and services for meters and instrumentation in Alberta. DV Meter has always been committed to the highest level of service and support, and our collaboration with Pyramid has only strengthened that mission. New industry equipment requires updated calibration and proving, and we have built an arsenal of tools to keep pace. Our units have all been approved by the highest standards, including the Alberta Boilers Safety Association and Measurement Canada. We have even built our own technology to further provide certainty in your meters and instrumentation.